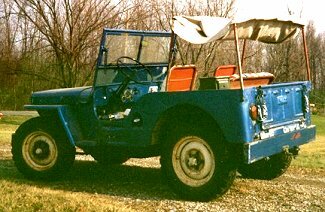 "I bought the Willys in about `92 from my stepbrother. It was in northern Michigan, and I brought it home using a rented flatbed trailer and a borrowed pickup truck. I had to convince my wife to let me buy it, as she really wanted a hutch cabinet to show off her china she had inherited from her grandmothers. I considered getting a vanity plate that read "HUTCH", but decided I didn't want to sleep in the barn with the jeep. "I never had the money to get the brakes fixed, and when we moved to the current house, I didn't have any place to store it other than the garage. I realized that I wouldn't be able to do much with it for awhile, so I put it in the front yard with a "For sale" sign on it. A few days later, a contractor who was working in the neighborhood stopped to look at it, and we settled on a price. He took it to a local mechanic, paid about $500 to get the brakes working about as well as they are ever likely to work, and took it up north to a fishing camp he owns. The camp was about 600 acres, and he wanted it for running around on the trails and roads there. He said he had no plans to ever put it on the road, so it probably still doesn't have plates on it."